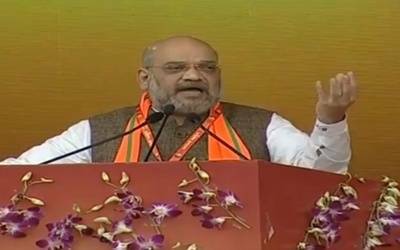 New Delhi, Feb 11 (IANS) BJP President Amit Shah on Monday stressed on purity in election funding and said that political parties must run with donations from party workers and not from the black money of the rich. The BJP chief also claimed that fugitive businessmen like Vijay Mallya and Nirav Modi are feeling the heat of the country’s strict laws. "They escaped the country fearing the law would catch up with them," he said. Highlighting Upadhyay’s role in the formation of the BJP, Shah said, "He made a party which was not ruled by the aura of its leaders but by its party workers and organisation."